If I had an alternate name for these muffins it would be “bear claw muffins”. Or at least that would be my husband’s alternate name for them. I used to love bear claws until I worked at a particular bakery where they became ruined in my mind. During my first day of work, the lady training me showed me a giant fridge where they kept old cakes. The ultimate fate of these old cakes was to be smooshed up with artificial almond flavoring, then inserted as a filling for the bear claws. I felt like a kid being told Santa doesn’t exist! I am sure many bakeries make bear claws using real almond filling, but they will never be the same to me. Maybe this was all for the better since I can’t eat bear claws now anyways. Can someone please come and tell me something gross about the process of making deep dish pizza so I won’t want it anymore either? 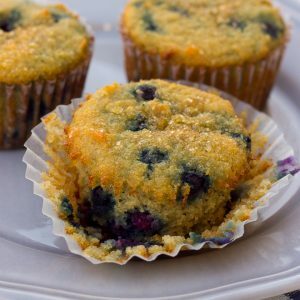 The good news is these muffins are not made using many-weeks-old cake! 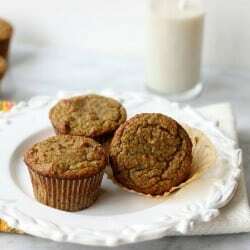 They are another lovely grain-free creation using high-fiber almond flour. These muffins would be delicious turned into a cupcake with cream cheese frosting. They are also great for breakfast or a snack topped with sliced almonds. These muffins are so moist on the inside. The real almond extract gives them a wonderful aroma. I wish I had another one right now. Enjoy these next time you have guests over for brunch! Moist and sweet almond poppy seed muffins that remind me of bear claws. Preheat the oven to 350 F (325 F if you have a dark-bottomed pan). Line 10 muffins cups with paper liners. In a large bowl, combine the almond flour, coconut flour, salt, and baking soda. In a medium bowl, whisk together the eggs, honey, palm sugar, coconut oil, and almond extract. Blend the wet ingredients into the dry using a hand mixer until thoroughly combined, then fold in the poppy seeds. Scoop 1/4 cup batter into each prepared muffin cup. Top with toasted sliced almonds if desired. Bake for 15-18 minutes, until a toothpick inserted into the center of a cupcake comes out with just a few moist crumbs attached. Cool and enjoy! I made these today and they are delicious! Thanks for the recipe! I’ve tried several of your recipes, and this is my favorite! Delicious! I baked these yesterday for my mother and her sisters. My mother and her twin sis have celiac spru, so they can’t eat gluten or wheat, and they both LOVED these muffins! In fact, they WANT the recipe! 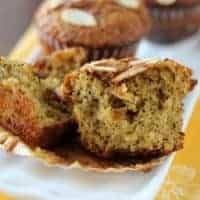 These muffins are moist, buttery, almond-y, and absolutely to DIE for! I will definitely be baking these again soon! I’m so glad they turned out for you! Just made these and they are yummy! I would like to make them in a loaf pan to slice. Any suggestions for baking times? Thanks much!